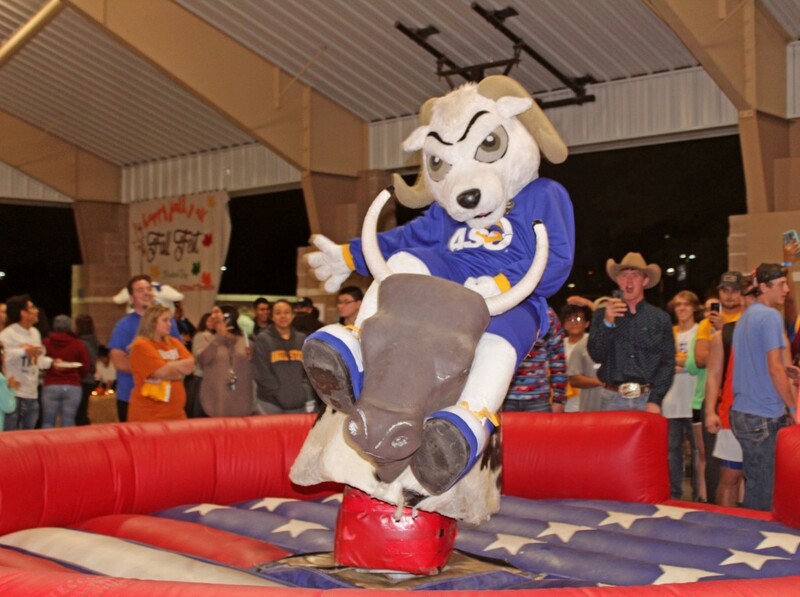 Roscoe the Ram takes the mechanical bull for a spin, beast versus beast. The record ride for the night was 97 seconds. Students enjoyed a night of food, music and games on Nov. 15 at the Annual Fall Fest, hosted by Greek Life and Student Organizations. The Sororities, Fraternities and other RSO’s that hosted the event also provided activity booths and gave away snacks and prizes. ASU’s Political Science Association was one of the organizations in attendance that had a game for students to play. "We had pin the tail on the elephant and the donkey because we are a nonpartisan organization," Secretary Carson Jones said. "We had people pin the tail on the animal and then answer a question about our government to educate people." This year is only the second year that the Political Science Association has been on campus. "We really wanted to get the organization out in the public, because we feel like a lot of people don’t know who we are," Jones said. "We wanted to be involved in something that had a high visibility rate, so we could get more people interested in PSA,"
The Association of Mexican-American Students also had a booth at Fall Fest. "Since we are a Mexican organization, we gave out the traditional snack of arroz con leche, which is a very popular item in Mexico, and hot chocolate, which is chocolate caliente," AMAS Vice President Luis Montoya said. According to Montoya, AMAS has had a booth at Fall Fest every year since it started. "It’s a good way to get members to come and get to know each other while enjoying other activities and just having a good time with everyone," Montoya said. Some other things students could do at Fall Fest were paint pumpkins, ride a mechanical bull, roast marshmallows and even take a stroll in a horse-drawn buggy. "I was really excited to get to ride in the buggy because I didn’t get to do it last year," Junior Talia Schell said. "I wasn’t as into the bull riding, but we took pictures, we got to talk to the people from some of the organizations, and there was a wide variety of food, which is the best. Fall Fest is definitely something that appeals to a wide variety of students."